Guided reading lesson plans... the mere mention of those words makes me shudder! I have spent so many hours of my life writing these lessons plans. I remember feeling so overwhelmed by trying to keep up with them. I sure hope none of you feel the same way I did! I have come to realize that "guided reading" means different things in different school districts. At the school district where I taught for the past 16 years, there were very "rigid" expectations for how guided reading lessons were to be taught, and very little "wiggle room" was allowed. 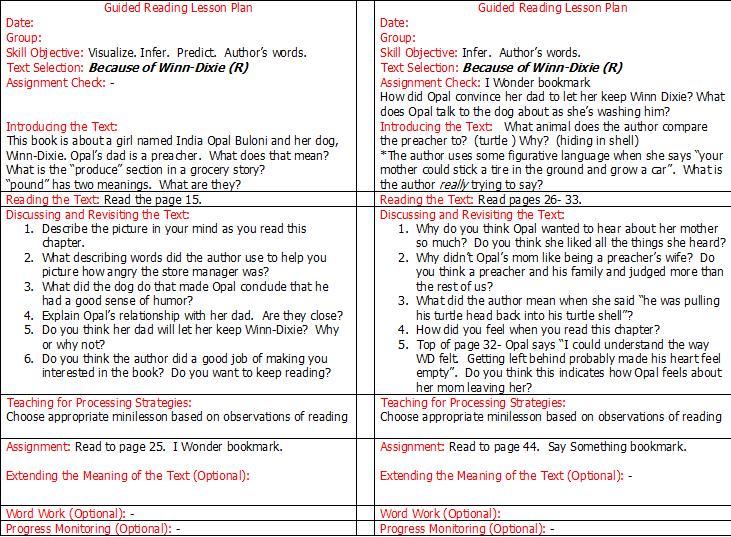 We had to write very detailed lesson plans based on Fountas & Pinnell's beliefs of how guided reading should be taught. Each lesson plan written had to include the learning target, introduction (which included introducing vocabulary), reading the text, and discussing the text (with higher level questions). The lesson itself also had to include a minilesson based on what I observed when I listened to students read during the lesson. Let me tell you, I spent hours upon hours writing these detailed plans each week- especially during my two-year tenure as a half-time reading teacher, when I worked with 8 guided reading small groups each morning. I worked with fourth and fifth grade groups who were reading primarily chapter books. I loved reading the books, but it was nearly impossible trying to keep ahead of eight groups of eager readers! Needless to say, the lesson plans I labored over are now sitting here on my computer "gathering dust", so to speak. 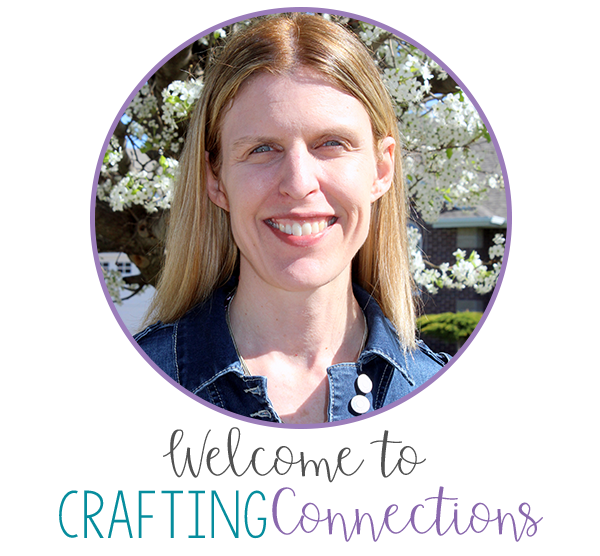 I realize that guided reading plans are highly individual, based on your district's expectations, the students you are writing the plans for, and your own unique style. Still, I decided to start by posting just one of my lesson plans here on my blog, just in case there is even one fellow teacher out there who can actually benefit from having this 9-day lesson plan! Maybe, if nothing else, it will give you some question ideas for the various chapters. 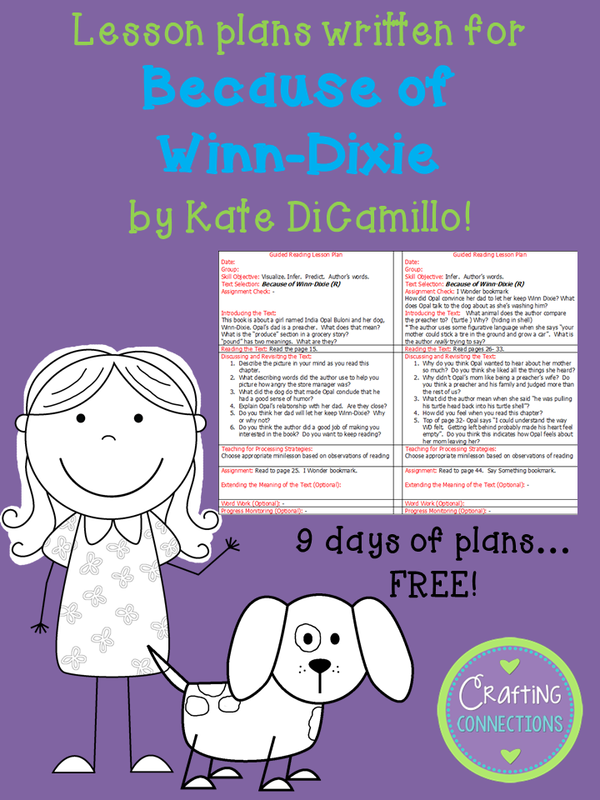 These are the lesson plans I wrote for Because of Winn-Dixie by Kate DiCamillo (Guided Reading Level R). They aren't cute or fancy, and you might run into a misspelled word or some of my random abbreviations, but I think you'll get the idea. Download the PDF version here, if you wish! Click HERE to download the Word version. Please let me know if this was helpful to you. That will help me decide whether I should post more of my plans that are "gathering dust". I would LOVE to see more of your Guided Reading plans! My school just implemented GR, making it mandatory, and it's a LOT of work! I'm teaching fourth grade but have a HUGE span of reading levels from non-readers to 6th grade level...I would appreciate anything! Thanks so much for the Winn Dixie Lessons! This is awesome! I would love to see more of your plans!! Thanks for sharing! Thank you so much! Both posts have been super helpful!! Thanks so much! I just switched from kinder to 3rd in TX so I'm struggling with higher level questions. Would love to see more!! This is beautiful! What are the bookmarks? I liked seeing your questions. It helped me add to the unit I am planning. Thanks! Just came across your plan and it was exactly what I was looking for! Thank you for sharing!